JVVNL recruitment 2018, JVVNL jobs 2018:. Jaipur Power Distribution Corporation Limited announced JVVNL recruitment 2018 for 3151 vacancies of various positions like AO Po, AP, Ljo, Steno, Junior ACCTT, Junior Asstt CA-II. 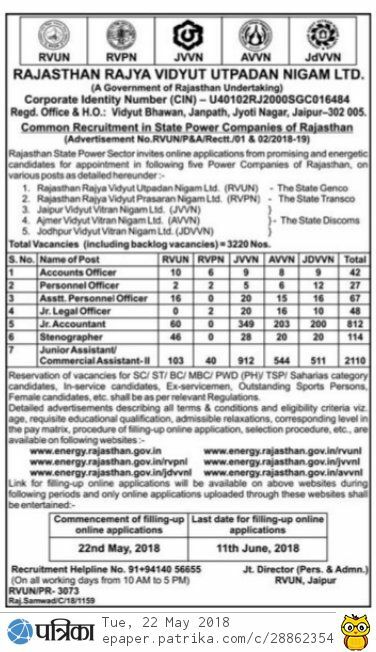 This would be a good opportunity for candidates looking for Rajasthan government jobs 2018. All qualified and interested candidates will be able to apply online via the official website Www.jaipurdiscom.com soon until the last date 11-June-2018. More of the details like age limit, qualification requirement, JVVNL online recruitment apply to below 2018 etc. JVVNL: Jaipur Power Distribution Corporation Limited is a government under taking the organization in Jaipur. This organization is responsible for generating and distributing electricity in Jaipur and near districts. The whole process is transparent. The main objective of this corporation is to deliver electricity near Jaipur and the districts. It does issue notification on periodic basis. This year it will soon issue notifications for recruiting different posts. Assistant Personnel Officer: Bachelor's degree. Junior Legal Officer: Law graduate. Junior Accountant: degree in commerce. Stenographer/ Junior Assistant: Bachelor's degree. Assistant Personnel Officer: Graduation degree.
. Junior Accountant: Degree in Commerce. Age waiver according to authorization criteria. Assistant Personnel Officer: Rs. 37,800/-. Jr. Legal/ Accountant/ Steno: Rs. 33800/-.